Hello guys i am back with another review. Today i am going to review Mustela products for you guys. Mustela Pakistan team was kind enough to send me their products twice. So today i am going to review my first package and will be reviewing my second package in few days as well. 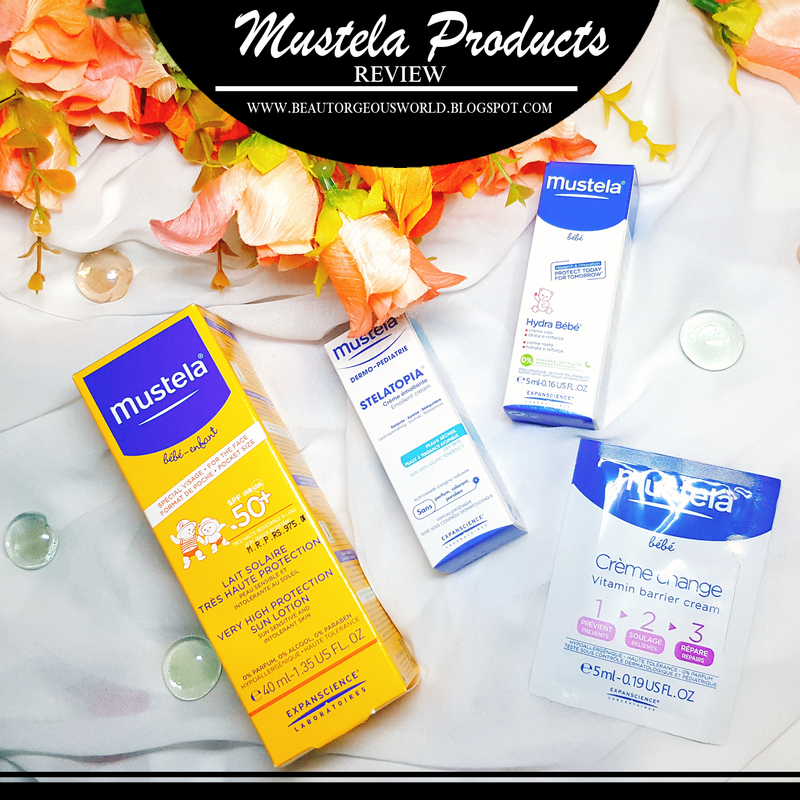 For the first time around Mustela Pakistan sent me their full sized high protection sun lotion and some samples of their other products. 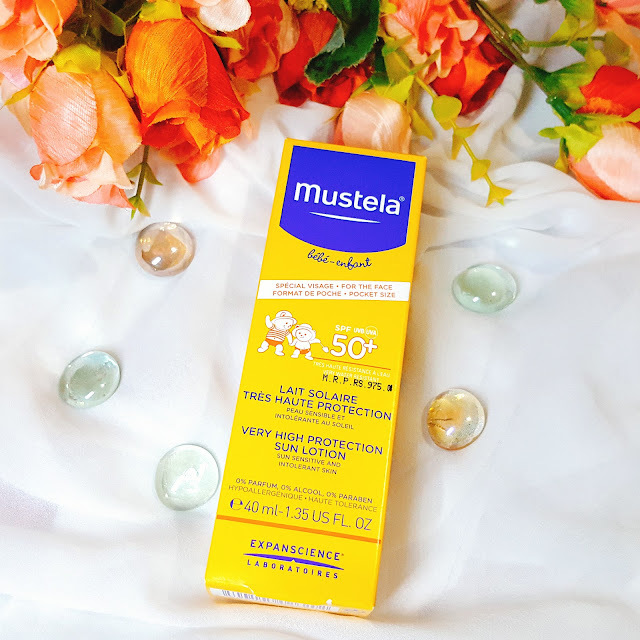 Mustela offers a complete range of products for newborn /babies and mothers-to-be. Their products are specially formulated to best address the changing delicate skin. 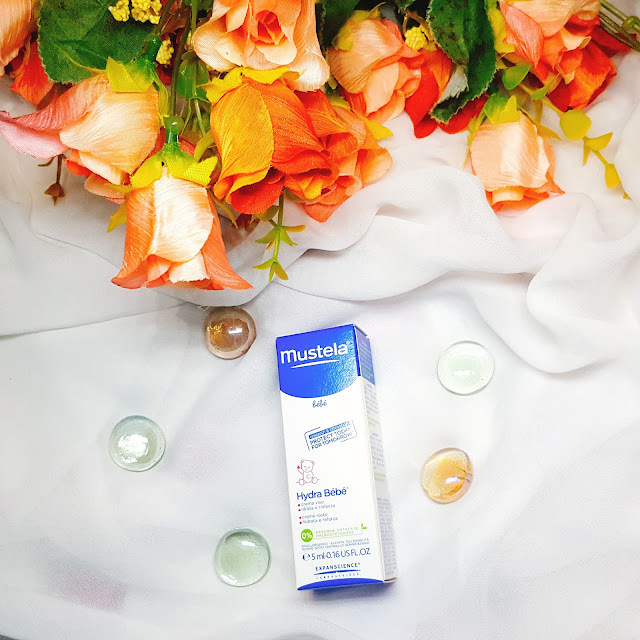 Mustela products are sold worldwide and have been recently made available in Pakistan as well. Though these products are for children, i use them for myself. 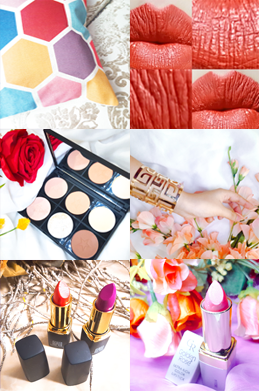 I have very dry and sensitive skin so i prefer products which do not have any harsh chemicals in them. It is only once in a blue moon that any product works for my skin. Though i have dry skin, i do tend to get pimples on my cheeks if i use any kind of cream or moisturizer on my skin other than one particular cream and lotion which i use on daily basis. 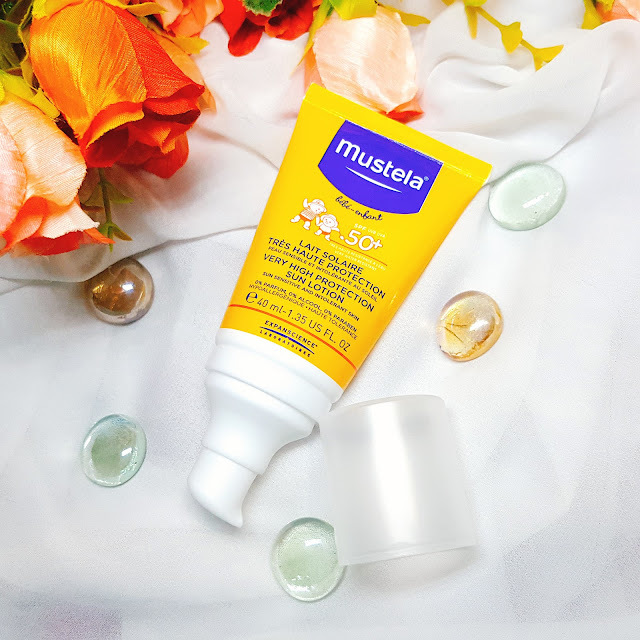 Mustela Hydra Bebe facial cream is a facial moisturizer for delicate skin of babies. I have used this product on my own skin and I am absolutely loving it. This cream has a very light texture and gets absorbed into the skin leaving the skin moisturized and soft. 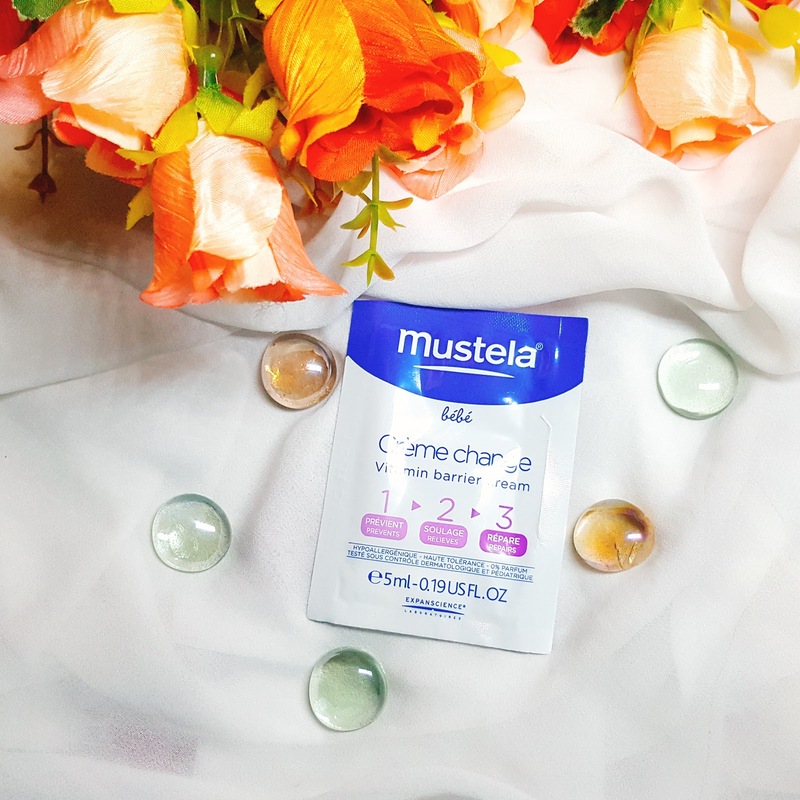 Mustela products have a very mild smell to them other than their hydra bebe products. Their hydra bebe products have a very strong but really good fragrance. I actually love this product as it doesn't show on my face and sinks into my skin completely making my dry skin, smooth and silky to touch. 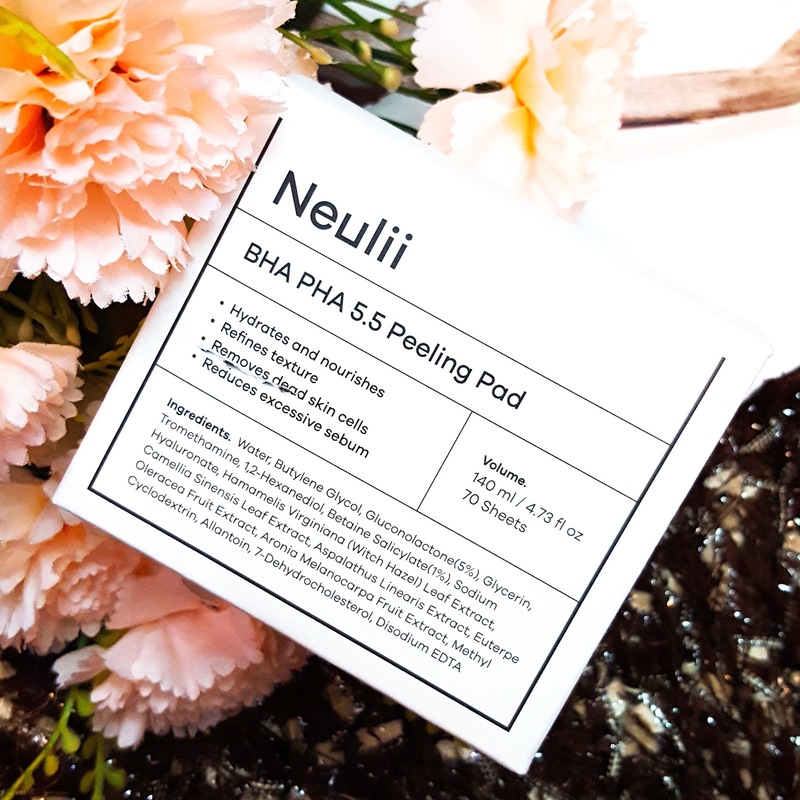 I was sent a sample size of this product so i can not tell you how it works in long run , but for the little i have used , this is absolutely amazing.This is definitely one of my favorite products from the entire range. The second sample i got is of 1 2 3 Vitamin barrier cream. This cream is meant to prevent, relieve and heal irritated and red skin. This is a very small sample and i have only used this cream on my feet .I applied a thick layer of this cream on my feet and wore socks over them. The very next day, I liked how it made my feet feel softer and brighter. I don't have any rashes on my skin so i can not tell you whether this cream works on rashes or not. 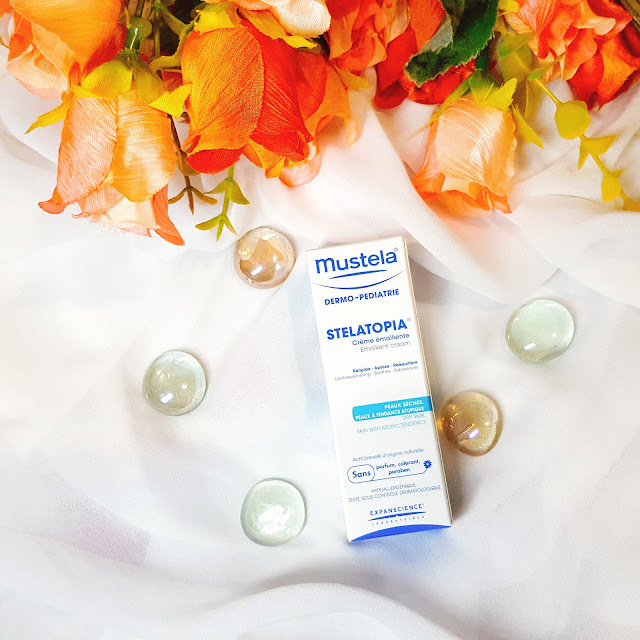 But just like all of the other Mustela products, i am sure this one is as amazing as them. This cream has a very thick consistency and you are suppose to apply a very thick layer of this cream to the irritated skin for it to work quickly. The third sample i got is Stelatopia cream . This cream is for children who have very dry and irritated skin (eczema). I do have dry skin but it is not as severe as eczema. This product is great for babies as it will keep their skin moisturized for a long while. I love this product for my skin as well and I use this product as a moisturizer. I apply this cream on my face before i apply foundation or bb cream.I always set my foundation with a setting powder afterwards as this cream does give a greasy look otherwise. After the use of this cream my skin feels so soft and i have actually started to notice that my dry patches are slowly vanishing . 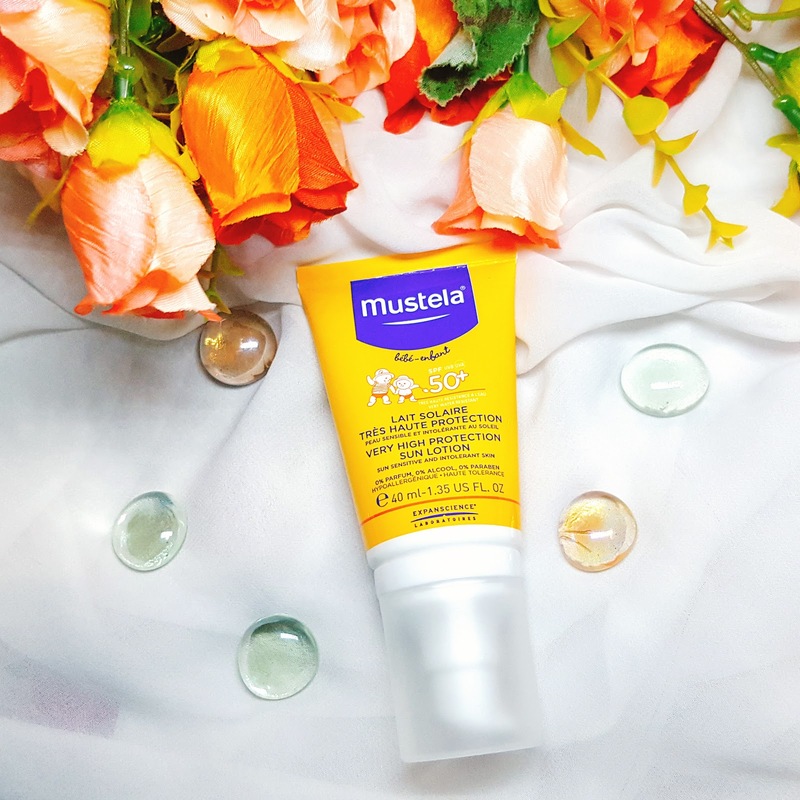 Last but not the least, Mustela team Pakistan was kind enough to send me their one full sized product which is their sun protection lotion. This sunscreen lotion has 50+ SPF as babies skin is much more thinner and sensitive than an adult. 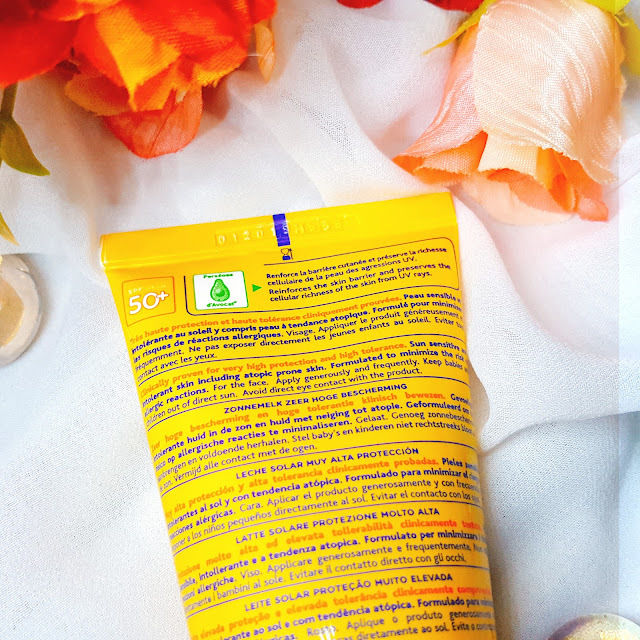 This sunscreen lotion not only protects skin from UV rays but it also keeps it moisturized. I really like how this sunscreen lotion works for my own skin. After moisturizing my skin with either Hydra bebe cream or Stelatopia , i always apply this sunscreen lotion on my face. Honestly i have seen a huge difference in my skin since i have started using this sunscreen lotion. My skin is not so dry anymore and my complexion is going back to normal from being dull. I really like the packaging of this this sunscreen as well. Firstly it has a pump in the front which makes the use of product very easy. Secondly the rest of the tube is squeezable which was very helpful when i was almost out of the product and i wanted to make the most of it.Will definitely buy this product because i loved it. 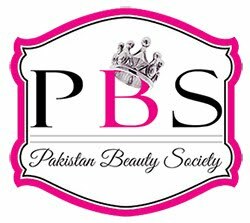 Another great thing about this sunscreen lotion is that it does not make you look like a white alien after application which most of the other sunscreen products tend to do.You can get this product from any leading store across Pakistan for just 975 PKR. To wrap this up i would like to recommend these products to everyone and not just babies. These products didn't cause any skin irritation or acne on my skin. They are amazingly moisturizing and nourishing.